Agulla started his international career by scoring a try on his debut, against Samoa, in December 2005. Since then he has gained the majority of his 17 caps on the wing, including a start against France in the opening game of the 2007 Rugby World Cup finals. Since his debut in 2005, Agulla has become a regular squad member for Argentina. He has contributed three tries, one on his debut, another against Ireland in the 2007 World Cup and then against Scotland in June 2008 when the visitors won 26-14 in Buenos Aires. Post World Cup Agulla enjoyed a spell in France with Dax, before signing for their Top 14 rivals Brive. Following impressive form on the wing, Agulla joined Premiership giants Leicester Tigers for the 2010-11 season. 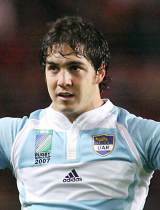 Agulla crossed the line twice during the campaign and was named in the Pumas final 30-man squad for the 2011 World Cup.